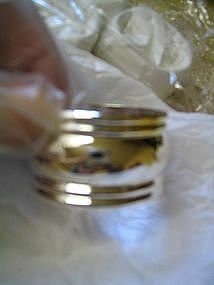 Set of 4 silverplate napkin rings manufactured in 1997. They have been in the original sealed bag wrapped in tissue paper until I had to remove one for the photograph. I did not touch with my hands but used a glove. I need your zip code to calculate the postage.